MorphOS throws out its old symbolic mascot in favour of a new and much more relevant member of the animal kingdom. MorphOS has long been famed for its blue butterfly mascot, a symbol of the metamorphosis of a new AmigaOS from the neglected pupa that was the old Amiga. The number of times it has been defaced in True Amigan avatars would testify to its power as a metaphor for this transformation; by its appearance alone it has annoyed, irritated and generally mocked the puritan zealots who can't take the fact that AmigaOS doesn't have to be branded by corrupt companies, as long as it's AmigaOS. However, after the effective publicity coup that was MorphOS.net, the remaining (and arguably sane) members of MorphOS core development team have decided that the butterfly is no longer relevant to their aims and intentions for their OS. 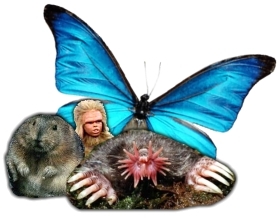 They have thrown out the distinctive cerulean lepidopter in favour of a new mascot which they believe to be far more representational - the lemming. "What's the problem?" said Ralph Schmidt, chief autocrat of the MorphOS project. "Lemmings have always been associated with Amiga." We fearfully reminded him that the new mascot was actually a lemming of the realistic, suicidal type, not the sort of anthropomorphic green-haired one found in Psygnosis' seminal puzzle games. To this, he replied, "I don't care." We ran away. But others in the development team believe the choice to be perfect. "Lemmings don't commit suicide, that's a myth!" said Sigbjørn Skjæret. "We have them in our country. Very tasty. ;-) They are actually providing us with the protein we need to get through the ten month-long winters by jumping off cliffs and drowning. ;-) Lemming and lutefisk, what a combination. Yum! ;-)"
Other suggestions of the mascot were doing the rounds. These included the junebug, the hedgehog, and even non-specific roadkill being pecked at by crows. Although interesting (especially the roadkill), they were turned down, because they came from people who weren't in the secret social circles the MorphOS development team hole up in and so can't possibly be good in any way. Sorry, we only accept dumb animals. Not retards. Then isn't possible Mike Bouma as mascot? Yes, crisot "the pirate of amiga software" as mascot would be very great! And Kjetil too! what you mean? to pirate stuff from evil morphos ppl is not crime!!?! Crisot, I love you, come to me with those pirate keys!!!!!!! Vote crisot as the most retarded guy of amitards in the next wrongplanet poll!